This winch system is easily mounted on both sides of the machine. The winch system of the 900VMB is completely different from the one of the 350VH. For one thing, the 900VMB does not require the winch to be mounted on top of the rigging system. Instead, the winch system is easily mounted on both sides of the machine. Steel cables are attached to the rigging system and run through the winch system on the machine. There is no need to mount a winch system on the rigging system. Therefore the riggingis relatively lighter which allows it to move around with a travelling speed of 0,5 meter per minute. Because the machine winches are feeding the cable through the winches, there is no need to use a drum for the steel cables to move over. Therefore you are not limited by the length of the steel cable. Thanks to this 'endless winch system', the height of the tank, or any other vertical surface you want to clean blast, is not an issue anymore. Because the winch system is mounted on the machine itself, the operator is able to control both the winch system and the steel blaster on one wireless remote. The spare parts and consumables listed below are designed to be fitted on the Blastrac 350 E/S shot blasting machine. The spare parts and consumables listed below are designed to be fitted on the Blastrac 500 E/S steel blasting machine. The spare parts and consumables listed below are designed to be fitted on the Blastrac 350VH steel blasting machine. A number of specific rigging systems to increase the performance of the 350VH steel blasting machine, and thus simplified the operator responsibilities and job scope. 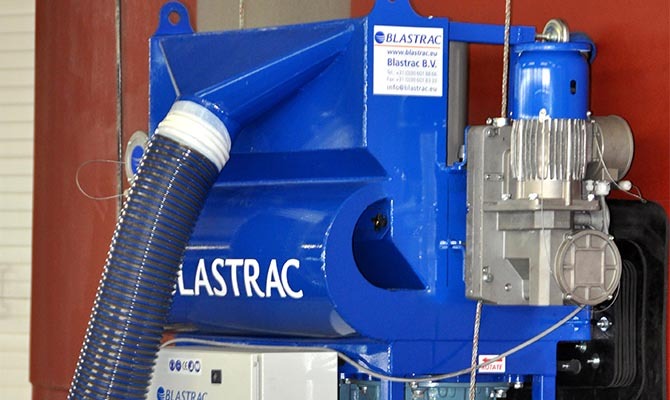 The use of the Blastrac hydraulic winch system gives the operator the advantage of being able to control the machine very comfortably from a mobile control station. Like the 350VH, the rigging system for the 900VMB can also be used to easily clean oil storage tanks, ship hulls and other large steel surfaces. Finding the right size, shape, and hardness is essential for the best results for shot blasting, or steel blasting requirements.